Another picture from the recent ostrich dissection (click for full-size, unlabeled version). Last time we were in the middle of the neck, looking from anterior to posterior. This shot is from closer to the base of the neck, looking from posterior to anterior. 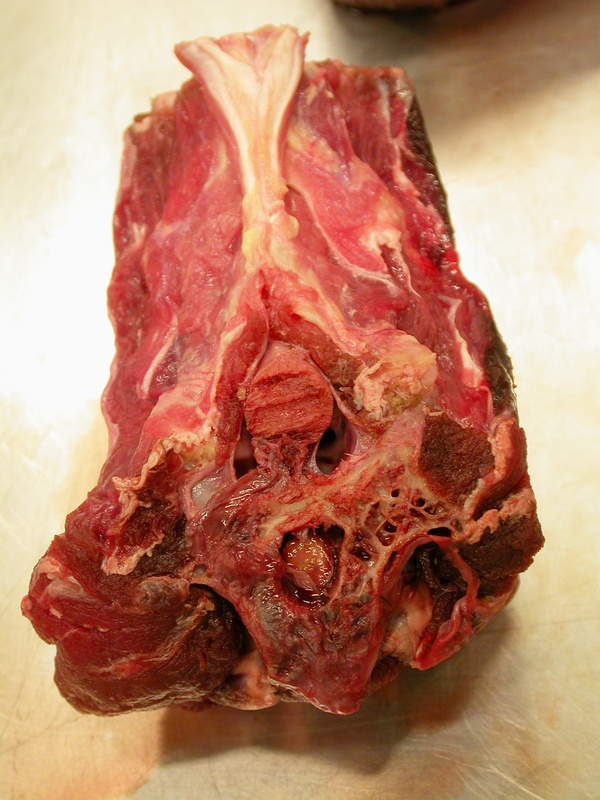 A lot of the stuff is the same: the ragged cut from the saw at the meat processing plant where the ostrich was cut up; the spinal cord with the supramedullary airways above it in the neural canal; and the large interspinous ligament with diverticula on either side. We’ll have reason to refer back to some of those things in the not-too-distant future, but right now I want to draw your attention to something else: the tendons of the paired longus colli dorsalis muscles toward the top of the photo. Here’s a modified version of Wedel and Sander (2002: fig. 2) with the course of the longus colli dorsalis highlighted in red (anterior is to the left). It is a curious aspect of bird necks that the large dorsal muscles do not insert on the neural spines but on the epipophyses (or dorsal tori or dorsal tubercles) above the postzygs. 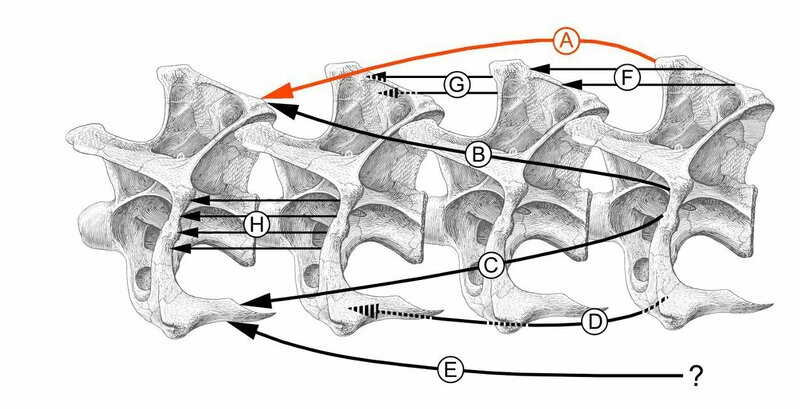 A naive approach based on beam theory would suggest that inserting on the neural spines would give those muscles more leverage, but necks are tricky and often defy such a priori predictions. Instead of inserting on the neural spines, the longus colli dorsalis muscles originate from them, especially in the posterior part of the neck, and that’s what the photo at the top shows. From the reader’s point of view, the big interspinous ligament runs forward to attach to the posterior side of the neural spine (not visible because it’s buried in gloop, but it’s about a third of the way down from the top). The longus colli dorsalis tendons are running forward from the anterior side of the neural spine. Fig. 20. An MRI of the mid-cervical series of an ostrich (Struthio camelus). In sagittal section, the interspinous ligaments are lighter than the surrounding muscle because of their high fat content. The neural canal is occupied by the spinal cord and supramedullary pneumatic airways. Also apparent in this image are the tendons of the longus colli dorsalis muscle originating from the neural spine. Scale bar is 4 cm. Here’s the same thing again, also in an ostrich, but in an MRI this time (and with anterior to the right; Wedel et al. 2000: fig. 20). The dark streaks running forward from the neural spines are those longus colli dorsalis tendons. 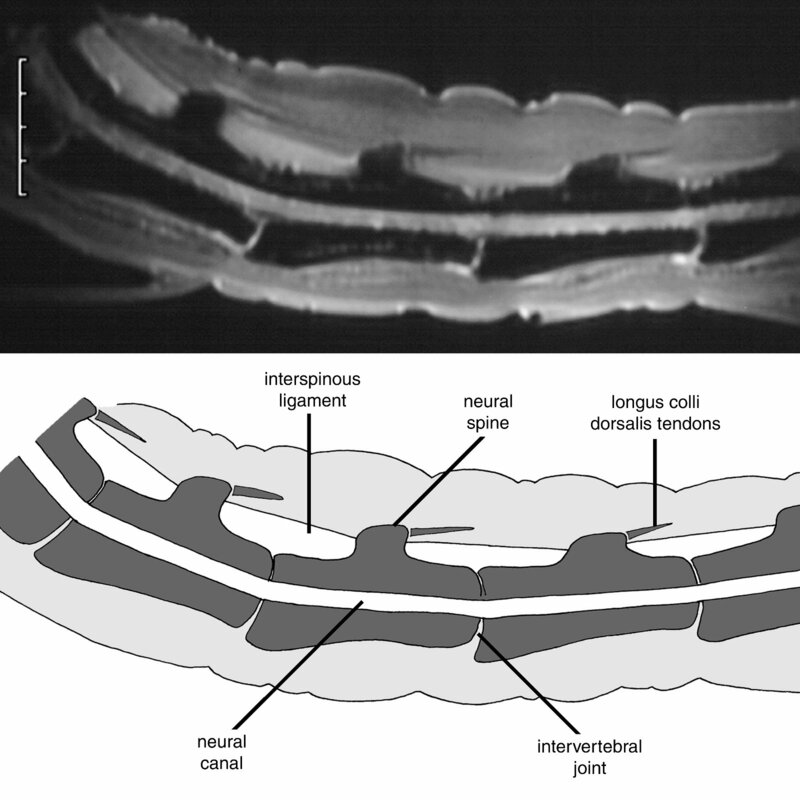 The interspinous ligament also shows up nicely as a series of white bands connecting adjacent neural spines. Wedel, M.J., R.L. Cifelli and R.K. Sanders. 2000. Osteology, paleobiology, and relationships of the sauropod dinosaur Sauroposeidon. Acta Palaeontologica Polonica 45(4): 343-388. Having hacked apart a couple of rhea and ostrich necks, I was greatly impressed with the strength of the interspinous ligament. Looking at the size of the scaring for the same ligament on sauropods instills respect for how much passive lifting force was likely present. « It’s not all doom and gloom in academia: at least Elsevier are increasing their profits!